The original scale model of the SIUE campus is available for viewing on the first floor of Lovejoy Library through the spring commencement ceremonies being held Friday and Saturday, May 5-6. The model features the intended design and appearance of the Edwardsville core campus, and was on exhibit during the campus groundbreaking in 1963. The display coincides with the upcoming presentation of an SIUE Distinguished Service Award to Gyo Obata, the external architect of SIUE, during the Spring 2017 commencement ceremonies. University Archivist Steve Kerber, and Library and Information Services Reference and Instruction Specialist Tiffany Dvorak, have organized the display that also includes support materials detailing the architectural history of SIUE. Obata will not be present at commencement, but will be featured in a video produced by University Marketing and Communications. Obata is a St. Louis native and a co-founder of HOK, the largest United States-based architecture-engineering firm. 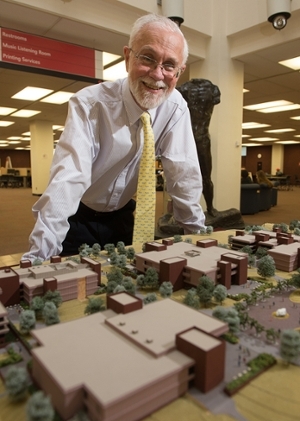 Photo: University Archivist Steve Kerber admires the original scale model of the SIUE campus on display in Lovejoy Library.